Palm Oil Tester enables you to quickly determine the Acidity (FFA), Peroxide Value (PV), DOBI & Carotene Content, Iodine Value (IV) and Anisidine Value (AnV) on Palm Oil with high level of accuracy. With its simplicity, Palm Oil Tester is ideal to be used during every production stages in palm oil industry to monitor the quality of oil in real time, from the oil mill to the refinery plant, during the acceptance and storage phases, as well as during trading of finished products. Furthermore innovative features and advantages make PalmOilTester widely used in quality control of food industries worldwide that involve palm oil ingredient. • A thermostated analyzer based on photometric technology that uses solid-state emitters. • A set of reagents prepared by CDR research laboratories. Reagents are supplied in bottles with a shelf life of one year. Furthermore, plastic cuvettes are supplied. • Pipettes with fixed calibration to ensure a correct collection of samples and an accurate dosing of reagents. • Print Manager: software that enables the analyzer to be connected to a PC in order to store and print the results of chemical tests. • DVD with filmed methods. 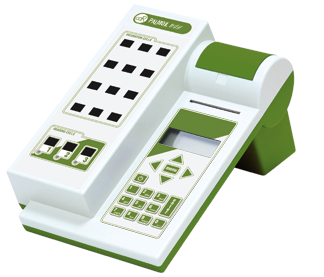 Palm Oil Tester is supplied with a 3-year warranty. Test results are available in few minutes. To run a test, it merely involves several simple steps. 1. Add in exact amount of sample to the cuvette by using a pipette. 3. Initiate the test and result is available in few minutes. 4. Results are printed by a built-in printer. At the end of test, there is no washing of containers, testing instrumentation or quartz cuvettes required. No additional equipment is necessary. As compared to official methods, it also minimizes waste, uses reagents with low toxicity and micro quantities of samples as it is. Unlike NIR and other photometric systems, it does not require complex calibration operations because it is supplied pre-calibrated. It is however possible to perform quick customized calibrations easily. Palm Oil Tester owes its high sensitivity, accuracy and reliability to: photometric technology that uses solid-state emitters, the digital signals processing, the possibility of aligning the system with reference standards and samples with known titration value, and the availability of reading and incubation cells thermostated at 37°C. Several comparative studies have demonstrated that the analytical accuracy of Palm Oil Tester matches that of referenced AOCS/MPOB methods, with the advantages that Palm Oil Tester is easier to use and outputs results much faster. Palm Oil Tester comes with illustrated operational sheets and filmed test methods that help the user to be certain about the system practicability.